Hip hip hooray -- an actual finish -- and one that I can cross off my embarrassingly long WIP list! I started this quilt in June of last year and used Melissa Corry's Drift Away pattern. 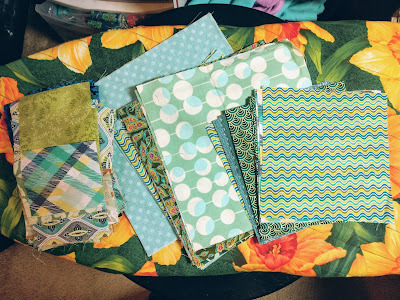 The intention was to cull some of my green, aqua, and blue scrap fabrics, many of which were leftover backing fabrics and medium-sized chunks of fabrics leftover from other quilts. This quilt did make a dent in my scraps and small cuts and as such, is full of favorite fabrics! I had this quilt pantograph quilted in a simple loop-de-loop pattern, so that it stays a snuggly bed quilt. The quilting is done with black thread, which is extremely contrasting from the aqua dot backing, but black ultimately was the best choice for the front of the quilt. I used the leftover backing fabric to bind this quilt by machine -- I only needed four binding strips since it was extra wide backing! I also had the perfect color of Aurifil to use for the top stitching too. This quilt is earmarked as a gift for one of the many weddings that are tentatively on our calendar for later this year. That is, unless my husband decides we need to keep it. It *does* match our bedroom. Sharing at Brag about your Beauties! Nicely done! It's always awesome to get some of our WIP's totally finished. You are not alone in having a long list! Great finish and it is a gorgeous set of colors. I love the quilting pattern you choose for it. Take that scrap bin -- hi-yah! Congrats on a very pretty finish and on working down those scrap bins. That has to feel good too.